Enjoy gorgeous 180-degree views of the water from this completely remodelled Marco Island condo with a full kitchen, a screened furnished lanai, and onsite amenities including pools, Jacuzzis, tennis courts, and convenient docks. 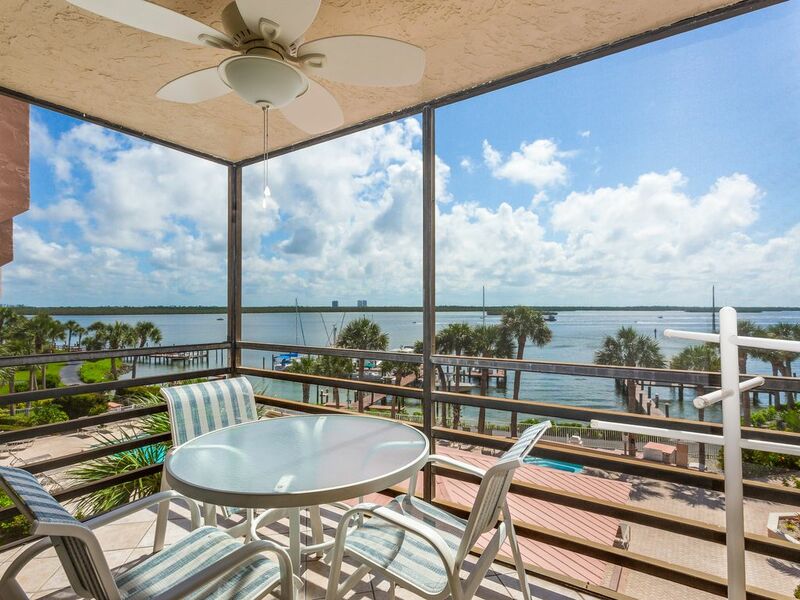 This delightful condo lies steps from Pelican Pier Marina on the Riverside Club property. A quick drive or walk to the nicest beaches in the area, Tigertail Beach and Marco Beach. Rent a boat, JetSki, kayak, or canoe from one of the nearby marinas and explore the surrounding waterways (or bike if you preferred to stay on land!). Stroll out to the end of the Riverside Club piers and enjoy some of the finest fishing in all of Marco. Grab dinner at the famous Snook Inn, located within walking distance of your condo! This fourth-floor east facing condo is perfect for a romantic getaway with beautiful sunrises and dolphin watching right from your lanai! This home also includes free WiFi, contemporary furnishings, a private washer/dryer, and loads of options for home entertainment including cable TVs, books, and games. With two pools, Jacuzzis, shuffleboard, tennis courts, and a barbecue area with grills you may just find yourself spending much of your time close to home! Enjoy a fun relaxing break by the water at this modern Marco Island condo. Book today! Parking Notes: Guests must obtain a parking pass from the office, open Monday-Friday 9am-5pm. Guests are allowed to park one vehicle inside the gate. All other vehicles must park outside of the gate in the guest parking area. Dock Details: Dock access is available on-site. Guests must coordinate dockage and availability with the office. Water Access: Dock on site. Needs to coordinate boat slips info and availability with office, Shelly. Inside of condo was nicely updated. Bedroom needs curtains or room darkening blinds because it was like sleeping with lights on. Bed needs new sheets as they are really old. Outside of property was dated! Good location with everything in walking distance! A lot of construction being done so it was very noisy this week. Nice heated pool and friendly community! Beautiful remodeled condo with comfortable furnishings. Lots of extras for a peaceful vacation! This is a modern, well supplied home with all the amenities you'll need to have a wonderful vacation! Wonderful and comfortable accommodations- very clean and nicely decorated!! Definitely will consider coming back to this unit!! The view of the water was amazing!!! This place is perfect for a couple! This apartment is perfect for two.licated on the fourth floor of a complex. There is a lovely pool, hot tube and canal right insight. Wake up each morning to a colorful sunrise. I would return without question. Our family of four stayed at this condo. Great location, quiet, and convenient to groceries, etc. The pool temp was very comfortable. Saw dolphins off the dock. The pullout couch wasn't the most comfortable but our older kids did okay with it. It would be perfect for a couple to stay here.